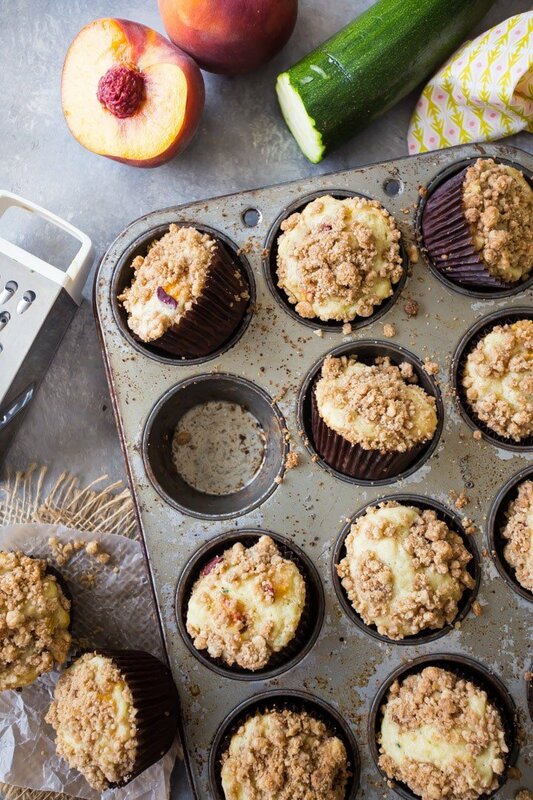 Enjoy late summer’s most delicious seasonal produce with these peach zucchini crumb muffins! Moist and full of fruit, with a crumbly, spiced streusel topping. This is a sponsored post, written by me and created in partnership with Stemilt Growers. All opinions expressed herein are straight from my heart. It’s late summer, and right now I am ALL about the peaches. And the zucchini! In the last few weeks I’ve shared my favorite peach cobbler recipe, as well as a killer zucchini bread. And today we are combining the two for these incredible peach zucchini crumb muffins. This peach zucchini crumb muffin recipe is based off of my favorite chocolate chip muffins recipe. I’ve just tweaked it a little bit to make it more healthy, and added a crown of cinnamon streusel. I use this streusel topping on so many different things! Here’s a link to the standalone recipe: Basic Streusel Recipe. 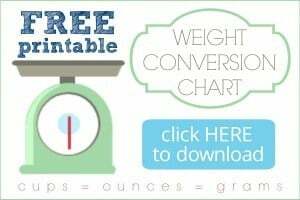 It can be modified in lots of ways, and I think you’ll really love it on all sorts of different muffins and coffee cakes. 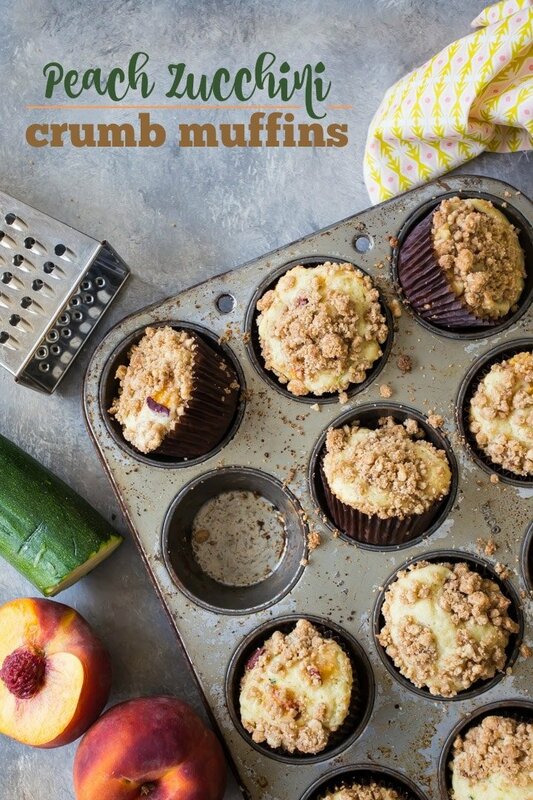 To make these yummy muffins, start with the crumb topping. It’s as easy as tossing melted butter with flour, sugar, cinnamon, and salt. Next, measure out the dry ingredients into a big bowl. This recipe calls for a combination of all-purpose and whole wheat flours, but if you prefer you can just use all-purpose. To that you’ll add sugar, baking powder, and salt, and give it all a quick whisk just to combine everything. In a separate, smaller bowl, melt the butter and add Greek yogurt, milk, eggs, and vanilla. Shred your zucchini (I used the side of a box grater with the larger holes), and set it in a fine mesh sieve to drain. Sometimes zucchini can be really watery and you don’t want all that extra liquid in your muffins because it can weigh them down and make them heavy. If your zucchini is extra juicy, use the back of a spoon to press it against the strainer and get as much liquid out as you can. Pit and dice up your peaches, then add the liquid ingredients to the dry. Fold the muffin batter together until you see some streaks of flour. Then add in the zucchini and peaches and fold just a few more strokes. You want to be careful not to overwork the batter. If you do, your muffins could come out tough, and we want them light and tender! Transfer the batter to a lined muffin tin, and sprinkle on the crumb topping. Sometimes I like to squeeze the streusel in my hand a little bit as I’m putting it on. This helps there to be nice, big, crumbly boulders of streusel. Bake the muffins up and enjoy! HOW LONG WILL THESE PEACH ZUCCHINI MUFFINS KEEP? I’ve noticed that if I put crumb muffins into an airtight container, they often become soggy and the topping loses it’s delicious texture. So what I do is just keep them in the muffin tin, and lay a piece of plastic wrap right over the top. I put it on loosely, but seal it around the edges of the pan. It works just right and the muffins will stay nice for 2 to 3 days. After that point, they need to be refrigerated so that the fruit doesn’t become moldy. They’ll keep for a week or so in the fridge. 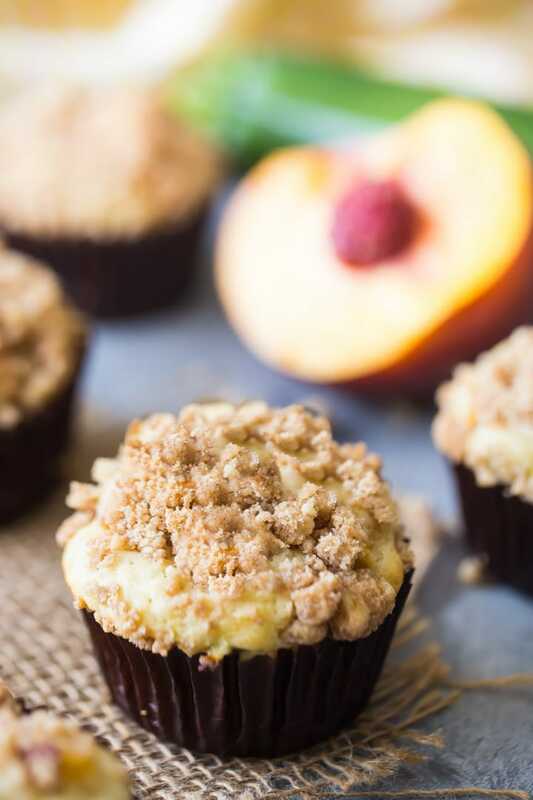 Another option is to freeze these peach zucchini crumb muffins. I do this a lot with muffins- just toss them into a zip-top bag and freeze. They’ll last for at least a month in the freezer. When you want to eat one, just let it come to room temp or microwave for about 20 or 30 seconds. Perfection! My family has been enjoying these peach zucchini crumb muffins for the last few days, and I think yours would too! They make such a scrumptious breakfast, brunch or snack. I hope you’ll give this recipe a try, and let me know what you think! 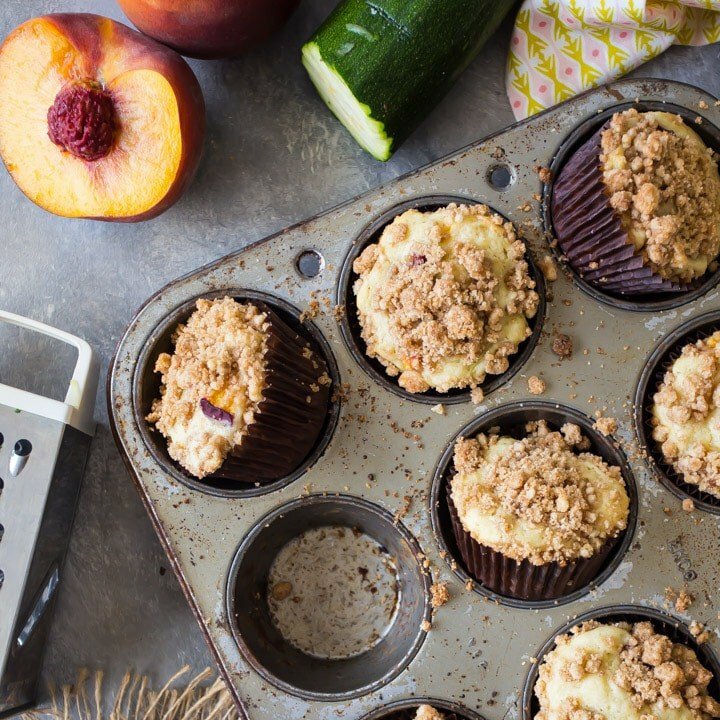 Enjoy late summer's most delicious seasonal produce with these peach zucchini crumb muffins! Moist and full of fruit, with a crumbly, spiced streusel topping. Please visit Stemilt's blog, The Stem, for the full recipe directions. *Sour cream or buttermilk can be substituted. Make your own buttermilk by stirring 1 tablespoon of lemon juice or white vinegar into 1 cup of regular milk. Allow the mixture to stand for 5 minutes, or until thickened and slightly curdled. 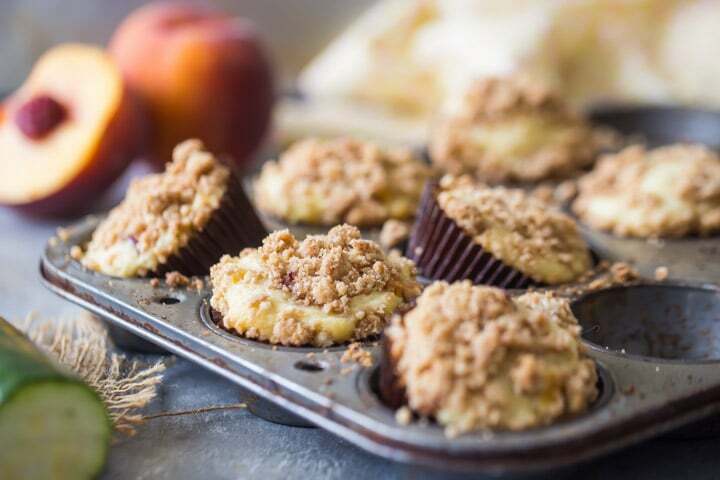 I love anything peach, so this sounds like a delicious muffin recipe! !